Social media has become a key part of the purchase decision making process. Review sites and other feedback systems online provide consumers with a platform to discuss and rate products based on their experiences and consequently influence other people’s decisions. During a trip to Florence, I came across a small restaurant. 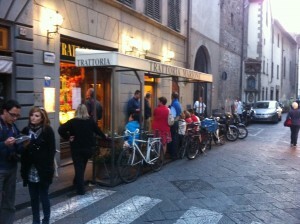 Trattoria Marione was a small and an unassuming restaurant not unlike many of its competitors. However, what set it apart was the crowd of tourists congregated outside waiting for the place to open. What was so special about the place? Imagine that you had to choose between two restaurants which are right next to each other. For all intents and purposes, they are very similar except for the fact that one is empty and while the other has a couple inside. How do you choose? You are more likely to choose the restaurant with the couple in it despite having no prior knowledge of either establishments. The interesting bit is that other people will make the same choice based on the one you’ve made. This is what we call herding behaviour. What happened? An informational cascade occurred. Having observed the actions of individuals ahead of you, you follow the behaviour of the preceding individuals without regard to the amount of information available to you. Herding behaviour is a product of our preservation instincts. In the face of a predator, each individual reduces the danger to itself by moving as close to the group as possible. The herd then appears to move as a single coordinated unit. However, the actual function of the group is nothing but a product of the uncoordinated behaviour of self-serving individuals. Humans by nature share an unconscious impulse to herd in situations of uncertainty. The psychological dynamics within the crowd eventually manifest itself as a social mood trend. The social mood trend generated by the herd then produces a single social action. Stock market trends are a great example of this herding behaviour as people will often decide to buy or sell stock based on what they perceive to be general market trends. However by ‘following’ that trend, all they are doing is reinforcing the decision of multiple individuals who were only following someone else’s decision making pattern. This social action then results in a frenzied period of either buying or selling of stocks. Simply put, when people do not know, they are compelled to act like others do. How does it all relate to social media? Review sites, such as Tripadvisor and Yelp facilitate the herding behaviour seen offline. Once a restaurant, hotel or airline has been reviewed online, consumers begin to rally around it. Given, not all reviews are positive but each feedback is another individual joining the herd. The more reviews there are, the more people become part of the group. As the group gets bigger, the influence generated by that group also increases; thereby perpetuating its existence. But beware: Herds are ruled by the majority, not the wise. The informational cascade occurs based on human observational learning. Within psychology, social learning happens when people observe and imitate the actions of others. If their behaviour is reinforced by a positive outcome, the behaviour is repeated until a negative outcome is encountered. However what we tend to see as a result of online reviews is that given a substantial number of positive outcomes, negative ones are seen as a ‘one-off’, a fluke or just a general exceptions to the norm. Often, a negative reviewer might even conclude that their experience was really just a fluke considering the number of positive reviews other people have had. The reviewers then adjust their views accordingly or don’t contribute at all, thus eventually skewing the overall rating for the establishment. In my case, when I saw the crowd outside Trattoria Marione, my first instinct was to do a Google search for the restaurant. There were 96 ratings for the restaurant, which ranked no. 222 of the 818 establishments in Florence. 78% of the reviewers stated that they would recommend the place. By joining the (online and offline) crowd I assumed that the risk of ending up with a bad meal was lower than if I had chosen a random restaurant on my own. The verdict: the meal was…ok. I would hazard a guess that the quality of the food at Trattoria Marione is on par with other restaurants in the area. The online reviews did make me scrutinise the food, service and ambiance more than I would have had I not known about the reviews. Would I choose a restaurant again based on online reviews? Maybe, but I doubt I will enjoy it as much. Reading the online reviews raised my personal expectations of the restaurant to the point where I could not help but be critical of the situation. At the end of the day, the reviews the restaurant had generated online resulted in increased foot traffic offline. Social media delivered the results that the restaurant wanted regardless of whether they are aware of the phenomenon or not. Review sites do appear to be a double edged sword as people rely on others’ decisions and thereby evaluate the product based on existing reviews. We often assume that review sites are a collection of independent reports or opinions. However what we need to account for is that these ‘independent’ assessments of services/products may have already been influenced by preceding reviewers and their expectations may have already been mitigated or raised from the norm. Instead of unbiased reports, you could just end up reading a collection of very similar reviews from a self-selecting group of individuals who simply followed the herd. 3 Responses to Do humans herd like virtual sheep? Wow, I think this is one of the most well written posts I’ve read! I agree with your argument and I think review sites such as TripAdvisor and Ciao, while they don’t get the glory of Facebook or Twitter, actually have more of an impact on most business than the ‘big’ networks, so a very useful post, thank you! Good post! Thanks for exploring. I do think that reading reviews defintely influence my enjoyment of the location, and usually for the worst. I am over analyzing and trying to see what all the hype if about instead of enjoying my experience.